The Ridgeback Solo World is a solid single speed Winter companion, best for a mixture of short hops and longer training rides. If you're looking for a straight up Winter trainer then the Solo is probably a bit overbuilt, but it's a stable and dependable cruiser for the darker months. The heart of the Solo is a Reynolds 520 Cromoly frame, which talking to the Ridgeback designer turns out to be an evolution of the Genesis Flyer using similar tube profiles. The Flyer is designed as an urban machine and was overbuilt to a certain extent to mitigate against bumps and dings, the Solo gets this solidity too but it comes at the expense of a certain amount of ride quality. The frame is certainly stiff and puts the power down well but at times it's a little unforgiving. There's plenty you can do to compensate for this and certainly the Continental tyres do a good job of soaking up road imperfections. Although I found the 58cm a good fit in terms of reach I tend to run quite a lot of seatpost, and there wasn't enough of it with Aluminium one suplpied, so I swapped it out for a 350mm Carbon 'post from my road bike. Call it serendipity but it transformed the ride, giving a bit of compliance where it's needed. I'd certainly recommend it as a first upgrade and indeed other component choices could probably make way for it if the bike was specced a bit differently. Take for example the supplied clip and strap pedals. 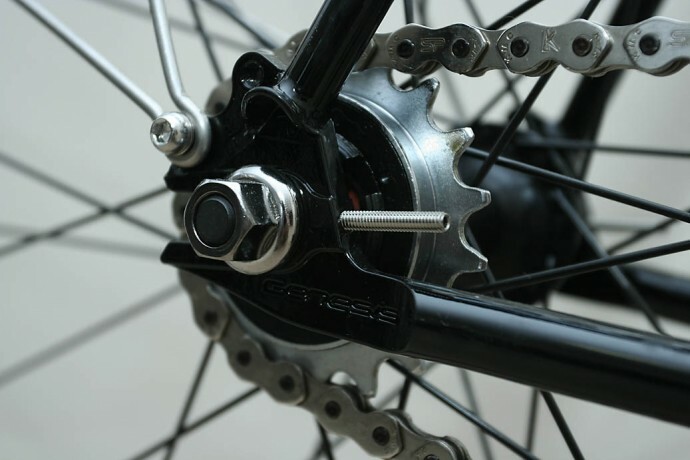 They saddle you with whole lot of toeclip overlap – especially with the mudguards on – and the first thing you'll do is swap them for your own units anyway. Better to supply the bike without the pedals and spend the money on a decent 'post instead. Other than that minor gripe the kit is sensible and hard wearing. 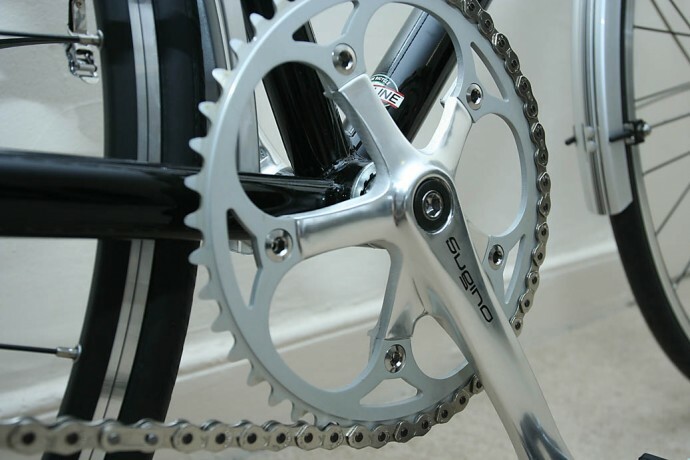 The Sugino 48T track chainset mated with an 18T Shimano freewheel gives a sensible 72" gear that's good for most riding. I'm not a quick or light rider but I've had the Solo up some steep climbs and cruised round some longer rides too, up to 70 miles. The Solo is at its best when it's cruising. Bring it up to speed on the flat and the Solo is happy to buzz along for mile after mile. The handling is great at the mid-range speeds that a singlespeed will spend most of its time at. The Solo feels a little pedestrian when it's moving slowly but a bit of speed in the solid-but-fairly-weighty wheels and the momentum combined with the fairly relaxed geometry combine to give an unflustered feel. 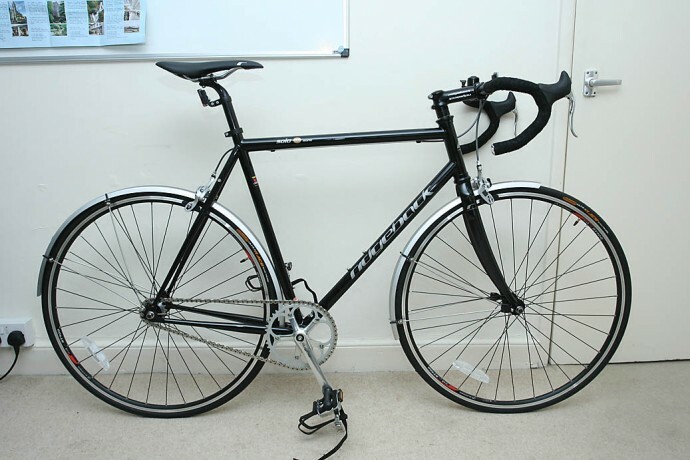 Some people will probably find it a bit too easy going, especially those looking for a Winter trainer to replicate the feel of a Summer road bike. Going down it's plenty stable enough and pointing upwards it's a lot more sprightly than the 10.1kg all-in weight and single gear would suggest. Power transfer is good, I wouldn't expect the bog standard square taper BB to last too long given the torque you put through a single gear, but it performed fine during the test period. The bars are a bit narrow, and the hoods a bit small, to get good leverage when you hit the steep stuff and I'd rather have seen a 44cm bar on the 58cm machine. Other than that the controls, such as they are, are fine. The brakes aren't anything special but there's plenty of stopping power available. The overall impression is of a well rounded machine that's comfortable on a longer ride but better suited to mixed use through the Winter. If you're looking for a workhorse then it may well suit, if it's a trainer you're after then you might want something a bit more lively. Tell us about the bike spec. List the components used to build up the bike. Sizing and fit: how was the bike in terms of height and reach? How did you find it, and why did you think that was? The 58cm frame was fine in terms of fit as I tend to run a long seatpost. The seatpost supplied with the bike wasn't long enough though, so I swapped it out for a 350mm Carbon 'post from my road bike. Comfort and efficiency: was the bike stiff? Was it comfortable to ride? Tell us how you felt about the ride. The bike's certainly stiff, sometimes to the point of being unforgiving. Running a Carbon 'post helps and the tyres are a good choice to smooth out the rough stuff.